Natural Disasters and Cuba’s Agricultural Performance: Is there a Correlation? Almost since the beginning of the revolution in 1959, the Cuban leadership and some foreign scholars have blamed mother nature for the failures or inefficiencies of the agricultural sector.2 I could easily fill many pages with quotes from Cuban officials, especially from President Castro, that illustrate my point. I think that the quotes in Box 1 are sufficient. They speak of both droughts and hurricanes. The abundance of such quotes challenged me to research the topic. Several questions came to mind: Can we really say that nature has been especially devastating during the current Cuban regime? Have there been more natural disasters during the socialist period than during similar prior periods? Is it easier to prepare for, and recover from, natural disasters after the revolution? If yes, Why? Finally, and a sine qua non, could I find data on droughts, flooding from excessive rains, hurricanes, and cold fronts? With those questions in mind, I looked for the definition of the events that encompassed natural disasters that apply to Cuba, and then I began my search of the literature to see what data were available. My objective was to compare the period 1959-2002 with 1915-1958; that is, 43 years before and after the revolution took power. Although there are several natural disasters, I chose those applicable to Cuba. They are: cold fronts, flooding, drought, and hurricanes. Cold fronts are not specifically defined in Cuba’s official statistics since they do not consider the temperature of the events. Rather, they are classified in terms of wind velocity during the cold front: weak (winds from 20 to 35 km/hour); moderate (winds from 35 to 55 km/hour), and strong (winds of 55 or more km/hour). The official cold front season is from September to June (Anuario, various issues). Flooding occurs when a body of water rises and overflows onto normally dry land. The Grade 7 Natural Disasters Project3 classifies flooding according to its origin into: coastal flooding of lakes and oceans, and river flooding. In the case of Cuba, our concern would be coastal flooding from hurricanes, and river flooding from excessive rains. The Anuario Estadístico de Cuba does not contain a specific definition. Drought is a period of abnormally dry weather that causes serious hydrological imbalance in an area. There are three types of drought: meteorological (lack of rain over a long period of time); hydrological (critically low ground tables and reduced river and stream flow); and agricultural (extended dry periods and general lack of rainfall resulting in a lack of moisture in the root zone of the soil, which severely damages the plants in the area). The “Palmer Drought Severity Index” is used to indicate areas of the country that are more susceptible to drought. The agricultural and economic impacts are the most damaging events.4 The Anuario does not contain a specific definition. Hurricanes are warm-core tropical cyclones in which the minimum sustained surface winds is 74 mph (119 km/hr) or more. The Saffir-Simpson Hurricane Scale classifies hurricanes as: category 1 (winds 74-95 mph or 119-153 km/hr); category 2 (winds 96-110 mph or 154-177 km/hr); category 3 (winds 111-130 mph or 178-209 km/hr); category 4 (winds 131-155 mph or 210-249 km/hr); and category 5 (winds greater than 155 mph or 249 km/hr. This classification also considers differences in the size of storm surge and resulting damages.5 The Anuario’s classification, according to their intensity, differs slightly from the previous one. The three categories are: low intensity (winds 115-150 km/hr); moderate intensity (winds 151-200 km/hr); and high intensity (winds over 200 km/hr). The official hurricane season is from June to November (Anuario, various issues). • hurricane data are provided. They include: (a) total number of hurricanes by intensity, by month, and for the current year and an average of previous years sometimes starting in the nineteenth century; these data can not be broken down by the periods under study, however; (b) number of times that each region (western, central, and eastern) has been hit, by intensity, for the current year and an average of previous years sometimes starting in the nineteenth century, but can not be broken down by the study periods. All in all, despite the abundant information provided by the Anuarios, none could be used because, either some data were not reported, or those reported did not correspond to the periods considered in this study. 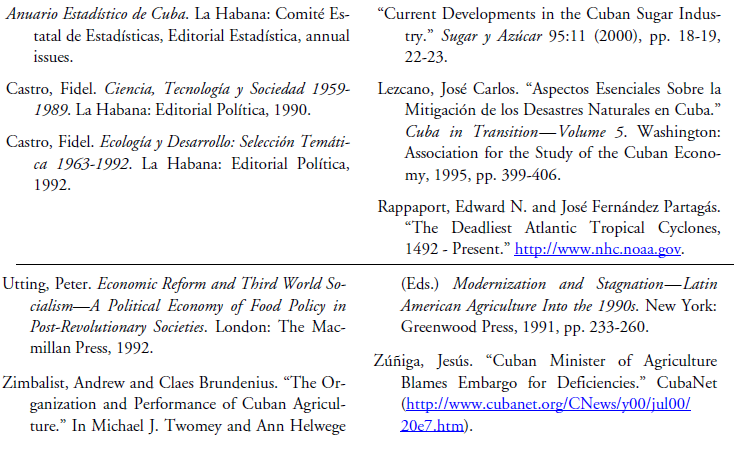 A search of other Cuban official publications, on hard copies or on the world wide web, did not provide better results. For example, the web site of the Institute of Meteorology (INSMET), part of the Ministry of Science, Technology and Environment,6 only contains a summary of the history of the national weather service but provides no comprehensive statistical information. During my search on the web, I came across the web site of the U.S. National Oceanographic and Atmospheric Administration.7 One of the documents related to hurricanes contains more or less appropriate data to assess if there are any differences between the two periods under study. A very comprehensive and voluminous publication by Rappaport and Fernández- Partagás covers the period 1492 to 1997. More information was found in another site.8 Both were used in an attempt to elucidate the questions posed at the beginning of this article. Atlantic tropical hurricanes9 from 1492 to date have been compiled from historical documents and current weather data by Rappaport and Fernandez-Partagas. They list a total of 467 hurricanes. The first list contains the deadliest 259, those hurricanes causing at least 25 deaths. The second list contains 208 hurricanes that may have caused at least 25 deaths. Twelve of the hurricanes in the first list (the deadlinest hurricanes) affected Cuba and none in the second list. 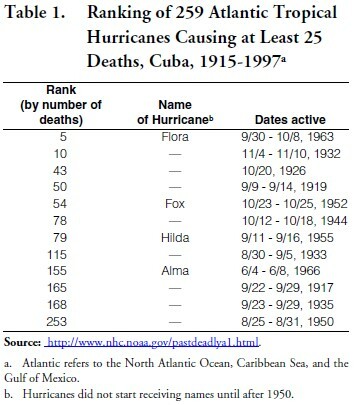 Ten of the 12 hurricanes hit Cuba during the 1915-58 period, while only two did so after 1959 (Table 1). That would give an incidence of one hurricane every 4.2 years for the first period versus one hurricane every 21.5 years for the second period. That, however, does not seem reasonable and is only part of the story. Table 2 also contains the number of times that each of the seven areas in Cuba has been brushed within 60 miles and the number of times it has experienced a direct hit. During the 1915-1958 period, these seven areas or cities were brushed within 60 miles more often (83 times) than during the 1959-2002 period (60 times). The opposite is the case with respect to the frequency of actual hits; there were 16 during the first period and 32 during the second period. It is very difficult to arrive at a definite conclusion. To check for the significance of these differences, I conducted a Student’s t-test for both events. This tool tests the means of two small samples to determine whether differences between them are significant. The results (at %=0.05) show that, concerning hurricanes brushing the island or passing within 60 miles, the differences between the sample means of the two periods are statistical significant at P < 0.07. Therefore, the greater number of events during the first period is in fact significant. Concerning direct hits, the results show that the differences between the two periods are statistically significant at P < 0.01. It is safe to assume with 99% confidence that Cuba has been hit by hurricanes more times during 1959-2002 than during 1915-1958. 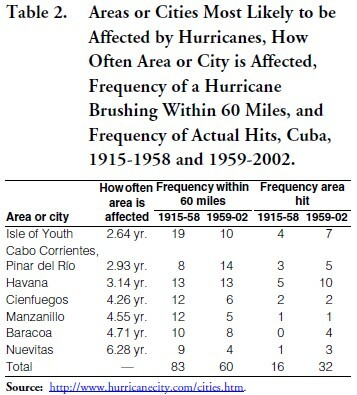 It is safe to state, then, that the data in Table 2 convey a statistical significance: there were more brushes of hurricanes within 60 miles during 1915-1958, but more direct hits during 1959-2002. The frequency numbers, however, do not tell the whole story. For example, and since we are discussing the impact of natural disasters on agriculture, a hurricane classified as Category 2 may be worse for agriculture than one classified as Category 3. It depends on whether or not its path followed an important agricultural area. Using the classification based on the number of deaths may also be misleading in terms of impact of agriculture. First, because the casualties may have occurred in the cities, with little damage to agriculture. Second, because a certain level of deaths may not be reached because of precautionary measures to minimize the hurricane’s impact. The latter may be particularly relevant for contemporary Cuba. Cuba has developed an impressive Civil Defense System (Defensa Civil), established by Law 1194 of 1966 and placed under the Ministry of the Armed Forces. During the process of institutionalization of the revolution in the mid-1970s, the Civil Defense System (CDS) was associated more closely, with the Committees for the Defense of the Revolution (CDR), becoming an integral part of the system, as dictated by Law 1316 of the same year (Lezcano, 1995, p. 401).11 As mentioned above, Cuba also has a good national meteorological service. When a hurricane is approaching, the CDS evacuates residents from the coastal and low areas, moving them to shelters until the storm has passed. This action changes the number of casualties and affects the perception that one obtains by looking only at the classification of the hurricane based on number of deaths since the loss of many lives typically is prevented by timely evacuation. A definitive answer to the questions posed at the beginning of this paper can not be stated. Lack of data hindered the analysis of cold fronts, floods, and droughts. In the case of the latter, there are abundant descriptions and quantifications on the more damaging droughts in the 1959-2001 period. But there is no consistent reporting, and data for the pre-1959 period are completely lacking. • information about the process of preparing for, and recovering from, the damage inflicted by hurricanes is incomplete during the 1959-2002 period and almost unavailable during the preceding period. This fact impeded the analysis of this important aspect of the impact of natural disasters. However, the existence of a very effective system of civil defense in socialist Cuba, which did not exist to the same extent in the previous period, leads me to conclude that the process of prevention and recovery from damages is better now than in the past. • Can we really say that nature has been especially devastating during the current Cuban regime? No, we can not, but we can not give an affirmative answer about the 1915-1958 period either. • Have there been more natural disasters during the socialist period than during a similar period prior to the revolution? In terms of hurricanes, the answer is “no” and “yes.” The answer is “no” because the period 1915-1958 experienced more brushes or passing of hurricanes than the 1959- 2002 period. However, the answer is “yes” for the frequency with which Cuba has been actually hit by hurricanes. Both answers convey highly statistical significance. 1. The author would like to thank Jorge Pérez-López for his comments and suggestions on an earlier draft. 2. It is interesting to note that “extreme climatic conditions” also have been used to justify other revolutionary agricultural failures. For example, Utting (1992) uses the excuse for the Sandinista experiment in Nicaragua. 9. They include those in the North Atlantic Ocean, the Caribbean Sea, and the Gulf of Mexico. 10. The frequencies, of course, are based on averages. Some countries, and even regions within a country, can experience wide deviations from those averages. Cuba is a case in point for the last years. Hurricane Georges swept the eastern part of Cuba in September 1998. One year later, in October 1999, Irene hit the western and central provinces. Michelle did the same to 45% of the island in November, 2001, resulting in the most devastating hurricane of the last 50 years. Then came Isidore and Lili, in October and November, 2002, respectively, which affected the Isle of Youth and the province of Pinar del Río within days of each other. These five hurricanes proved devastating to Cuban agriculture. 11. 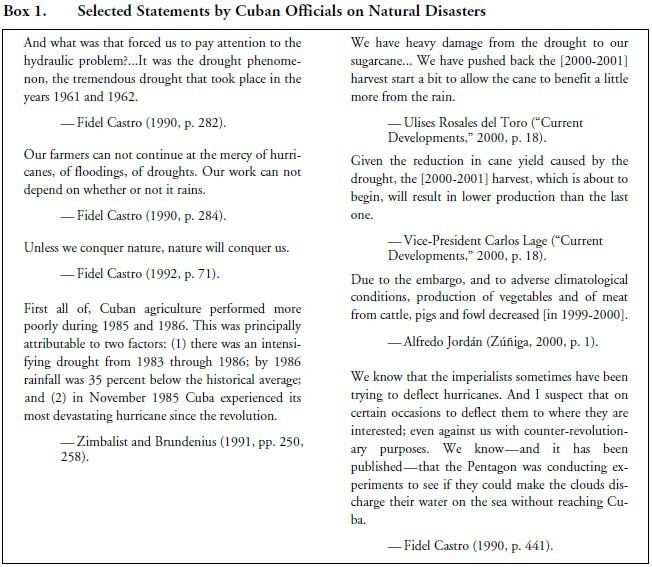 Interested readers can consult Lezcano (1995), who has a detailed description of the essential features of the system to address natural disasters in Cuba. 12. The Economic Commission for Latin America and the Caribbean (ECLAC) has developed a disaster assessment methodology for the Caribbean region. It identifies the long term social and economic effects of a natural disaster. Interested readers can consult http:// community.wow.net/eclac/CARLINKS/DISMETH.HTM.